As an avid diver I would love to see more turtles in the wild. How is the Turtle Farm doing with breeding the turtles? What do they need to do to increase the turtle population? I know people will blame the individuals that consume the turtle meat, but honestly the low turtle population is not soley due to them. Turtles have to lay eggs and nest somewhere. The chosen place to lay eggs are on the beaches….quiet, DARK beaches. Most of the beach front in Cayman has transitioned to residential property. The residential properties tend to have full lighting outside. Turtles will not nest, therefore no eggs, therefore no turtles. There are many factors, not just one. While consuming of turtles is a factor it is not the only factor. I am an advocate of consuming turtles as the turtle farm needs to be able to facilitate the demand. In order to facilitate the demand they are (or should be) pushing for an increase in the turtle resident population at the turtle farm. I understand that there are many turtles released in the wild, however I do not feel that the turtles that are released in the wild survive to the stage of nesting. Would it help if the turtle farm facitlity was larger? For the purposes of the turtles, not for tourists. Would it help if the public was allowed to 'adopt' a turtle and able to follow the life stages? Corporations could sponsor tank fulls, which individuals can sponsor an individual turtle. Similar to adopt a child. Incorporate the conservation of turtles into the school curriculum and make it mandatory for all children to visit the turtle farm once a year. Emphasize on the importance of conservation. No taking away our turtle meat! This would be political suicide. The fact there remains licensed open sea turtle fishing in the Cayman is a disgrace to the nation. For many tourists and locals alike an interaction with a turtle in the open sea is the highlight of being here. The fact that some people set out into that sea to kill them needlessly for food is shameful. yep… and its not great…thats why the rest of the world doesn't eat it! It's gourmet fare. You are probably used to bangers and mash. absolutely NOT gourmet! It's sloppy stew, tough, over-cooked and nasty. Only worth eating back when people were poor and had little else. Everyone loves the comfort foods they remember being served with love when they were children – but that doesn't make it "gourmet" – far from it! I challenge anyone to make the same recipe with beef and do a blind taste test. (but don't forget to over-cook the beef, and don't use good cuts – the tougher and more shredded up the better. It seems the person that cooked it for you didn't know what they were doing. Turtle meat isn't tough. It tastes quite nice. It is delicious actually. Turtle can be cooked in a variety of ways, not only stewed. It is unfortunate that you had a bad experience with eating turtle meat. It is also unfortunate that you do not consider it gourmet. Is gourmet lobster to you? Lobster was once considered food of the poor. It is all about perception. If you do not like the taste of chicken will you convince the world that chicken is not gourmet? Chicken can be made sloppy, with tough meat and shredded pieces or it can be made into a gourmet dish. Cannibals recommend certain human parts as being particular delicious. Delicious does not make it right. Ask some from Mauritius what dodo stew tastes like. Then should we all become vegetarians? Those poor chickens, cows, pigs, fish etc. Pigs and cows are not endangered. Turtles are. The longer this thread goes on the more absurd it becomes, but this is positively assinine. "Cannibalism"?! Don't use fancy words if you can't spell them. There you go proving my point. You have not had it cooked properly. Tastes nothing like beef. See what I mean – a gourmet would know the difference on a blind taste test. Simply delicious! Gourmet turtle soup is not made with sea turtles because they taste like the bottom side of a boat dock. My advice to you is stop sucking the bottom side of a boat dock and have some properly cooked turtle. Green sea turtle is the best tasting turtle there is. The only reason that turtle soup is made from any other turtle is because taking sea turtle is banned in some countries, in particular the U.S. Obviously if sea turtle was foul then no one would need to be conviced not to eat them. "The flesh of turtles was, and still is, considered a delicacy in a number of cultures. Turtle soup has been a prized dish in Anglo-American cuisine, and still remains so in some parts of Asia. [Gopher tortoise stew was popular with some groups in Florida. Turtles remain a part of the traditional diet on the island of Grand Cayman, so much so that when wild stocks became depleted, a turtle farm was established specifically to raise sea turtles for their meat. The farm also releases specimens to the wild as part of an effort to repopulate the Caribbean Sea". If you tasted it that means you have nothing against eating it – just that you prefer shepards pie. By the way does shepards pir contain shepards? I'm a Caymanian and I agree with you. Turtle tastes like local beef. Another dish that I dislike quite a bit. Great news! Good for you T&T!! Now if only Cayman will get with the times and do the same. Oh I know I know…it's tradition. Right. Well so was slavery, sacrifcing vurgins and marrying children at one time. It doesn't make it right. The turtle will go thr way of the Dodo Bird if something isn't done soon. 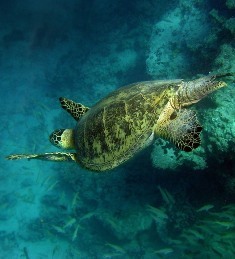 Cayman is doing its bit to help conserve turtles. That is one of the functions of the Turtle Farm. How dare you place our cultural traditions in the same sentence as sacrificing virgins etc.! How dare I? You mean how dare I tell the truth? Slaughtering turtles and sacrificing virgins are both cultural traditions (granted one is worse than the other, but the comparison holds) that made sense to some people at the time. The problem is that one of them – for some odd reason – still does make sense to some. You want turtle meat? Great, just head down to West Bay and visit the turtle farm. Get your meat there. Have stew turtle for dinner until you explode. Turtle steaks for lunch, and turtle pancakes for breakfast too. No problem there. Just leave what few remaining WILD turtles there are alone! If you want to keep playing the 'but it's our culture' card and go after wild turtles, then they'll soon be wiped out of Cayman's waters all together and you won't even have an option anymore. And on top of that, those tourists that come to Cayman for the great diving – in hopes of seeing a wild turtle – will go elsewhere and Cayman's tourism will dwindle. Leap into the 21st (heck, the 20th) century Cayman, pull your collective heads out of your rumps… and ban the slaughter of endangered wild sea turtles! You are very impertinent to insult Caymanians' traditions in our own country. There is no comparison whatsoever. You just happen to disagree with both. Actually, we are in agreement about getting turtle from the farm. Cayman is doing it's bit to conserve turtles?….. It's a damn little bit. The Cayman Islands were one of the worst depleters of turtles, if not THE worst, for many years, Now that they are almost gone the Cayman Islands should take the same course of action as the more far-sighted governments. Stop the killing of turtles! Would we had the courage to do the same….and cancel the licenses. Well done T&T!! I hope that one day we do the same. Would seem that other islands are starting to see the wisdom of Conservation especially when ones tourism depends on a healthy environment.We need to step up our conservation efforts and should be the LEADING country in the Caribbean region in that field.Seems like the more we "talk"about it the longer it takes to get done.How about adding the Conservation law to the LA's current meetings Mr.Minister?.What are you afraid of?Lets get it done for crying out loud.The rest of you Cabinet members need to TELL our Premier that this is vital to our Tourism product but having said that he above all else should remember the "talk"show we had.in that regard. I think it is a little misleading to say that "the Cayman Islands…sanction(s) an annual open season on sea turtles". While there is season during which any taking of turtle is prohibited (April-November) any taking of turtle outside that season is strictly regulated by the grant of special licences to traditional turtle fishermen and these are very limited in number. It is not a free for all. Would it be right to grant traditional kidnappers or murderers special licences? Huh? One has nothing to do with the other.